Doris Shades Of Bad has morphed into the travel series Doris Visits and with 102 films up in less than a year, and an OPERA TV On Line App, it is no surprise that the next plan is to stream test live shows in 2017. Executive Producer is joined by his long time producer Philip Keenan for this venture as they look to take on-line TV one step further. Keenan who left films to be agent to Anthony Hopkins at ICM is now looking for new ventures and also has a 360 film project in development. But the thing about the travel show for us film makers is that we do both, and we know we can produce another 100 films next year, and the year after. Our library of owned content then allows us to be TV Juke box along with a presented show. Executive Producer St Paul was first posted onto a ship by ITV's PR department. "The first time I entered the Arcadia I wondered why Dame Kelly Holmes had a framed picture on the wall in the atrium then on inspection I realised she had Christened the ship. Compared with Dame Helen Mirren's christening of the Ventura, Kelly's was a tame affair. Kelly had stilt walkers and balloons. Dame Helen got a team of Royal Marine Commandos and she abseiled down the side of the ship with them before breaking the bottle of Champagne! That is the style I would expect of her having worked with her on ITV's Prime Suspect years ago." But talking of history, the picture we use here is from 1978 Sunderland Empire Panto when Doris was the Fairy Godmother, but alas not to a ship. Doris is the character that comes from the award winning web series that put 61 episodes on line, Shades Of Bad. Earlier that year she got off a ship called a Floatel in Zsa Zsa where she was on tour with the then hit BBC TV show Seaside Special. Little did she know then she would be presenting a TV Travel Show nearly 40 years later and off and on ships like they were taxi cabs. BBC's Strictly Come Dancing star judge Darcey Bussell CBE can hardly be referred to as a retired ballerina. Ballerina she was and is, but retired no. She seems to work tirelessly on the dance show, with appearances and supporting good causes. 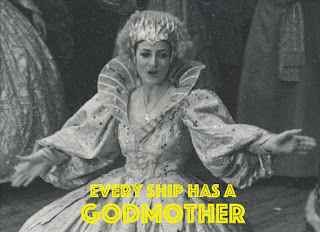 She is Godmother to the P&O ship Ventura, and after smashing the bottle, she presented a Ballet on board from the Royal Ballet. We wonder if she will be on the Strictly Come Dancing Cruises now lined up for 2017? Who will be on there, will Louise Redknapp win, will she be on the cruise? We do know there will be dancers, will be at least one judge, and the costumes will be on board ship on display. Click here for Strictly Cruise blog. But, back to pantos and the godmothers, the list is long but we have one or two missing which you might just know. Which ever way you can see how our content is growing . Keenan says that funding is important, and luckily INDYUK has a good track record for these out of the box ideas and funding was not an issue. We have three years fiscals planned out, but it is where this could go makes it interesting. Sign up and follow us on www.DorisVisits.com, and follow Doris Visits on Twitter and Facebook and share. Latest cruise deals can be found from our links. Doris Visits will be streaming our first live TV show in 2017.